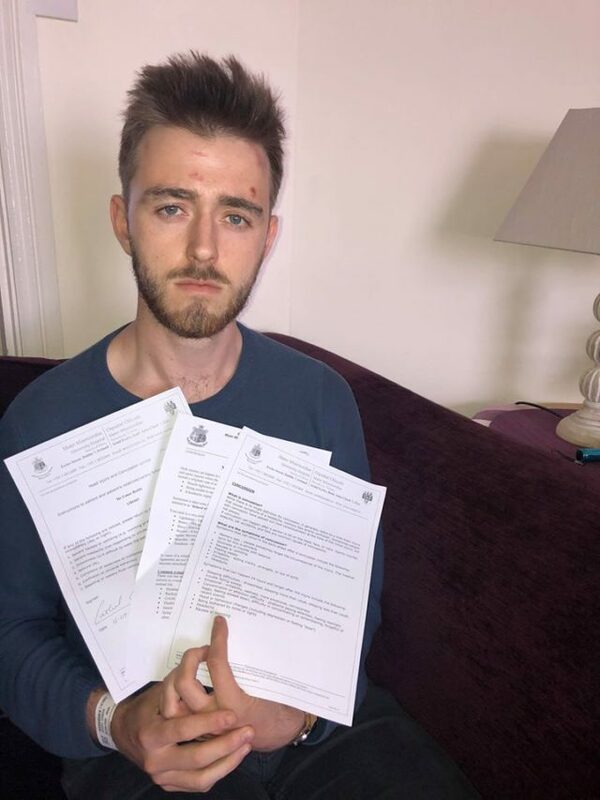 A student who says he was taken to hospital after being removed from a housing protest by Gardaí has criticised the force’s alleged heavy-handed tactics. Five people were arrested on Tuesday night in Dublin’s North Frederick Street as Gardaí attended the property accompanied by an unidentified private contractor group to evict housing protesters. One protester, student Conor Reddy, 23, who was taken to hospital on Tuesday night, says the reaction from Gardaí was unprecedented. “The place had been emptied by the time I got there, there was already a Garda presence on the scene, wearing balaclavas, and the riot squad had set up a cordon,” he said. “We exercise civil disobedience, so we sat down on the road in non-violent protest. “The minute I sat on the road, I have seen a level of escalation that I’ve never witnessed before, four masked guards grabbed me violently, wrestled me to the side of the road, dragged me behind the van. “I went limp and did not resist to be handcuffed, after that I had knees dropped in my back and elbowed, I got a knee to the back of the head that knocked me semi-conscious, my head hit the tarmac, I don’t have much recollection from that point on. “I was quite dazed and confused when I was taken to Store Street Station, I stayed there for around two hours but was let out without charge. “When I was released, I immediately went outside and vomited and didn’t feel myself, and was advised to go to hospital. “I was taken to the Mater and assessed and scanned and was admitted straight away, I couldn’t even give my phone number. “I was there till noon today. “I was diagnosed with concussion, and soft tissue injuries and a deviated bone in my neck, where it’s bent out of where it’s supposed to rest, which gives you the idea of the force used. According to those at the scene, about 15 to 20 men arrived outside the property in a van with no registration plate at its front and a UK registration number at its rear. Two protesters were charged and bailed to appear at court in October. Two received adult cautions and one was released without charge, with a file being prepared for the DPP. The group took over the property as well as another property in Summerhill Parade over the summer to protest housing conditions across the country. The order to vacate North Frederick Street was issued on August 28, when the High Court ordered anyone occupying the house to vacate by 2pm the next day. Justice Michael Quinn granted the owner of 34 North Frederick Street, which had reportedly been derelict for three years before the occupation, injunctions requiring “persons unknown” to vacate and cease trespassing in the four-storey building. Take Back the City, the group facilitating the occupation, slammed the Gardaí. Green Party justice spokesman councillor Roderic O’Gorman questioned the tactics used by Gardaí. “It is alarming to see that a protest seeking to highlight the serious housing crisis in the city was policed in this manner,” stated Mr O’Gorman. “It is unsettling to see Gardaí policing a protest in balaclavas. “It sets out a highly confrontational tone and is the exact opposite of the openness and transparency in policing that we should expect from An Garda Siochana. Sinn Fein justice spokesman Donnchadh O Laoghaire said the response was disproportionate. He added: “I have received reports of private security arriving in unmarked cars, being escorted in by armed Gardaí, and also reports of protesters being threatened with pepper spray. “I have also received reports of an injured protester. “If these accounts prove to be correct, then this constitutes an absolutely disproportionate response. “It is important that it is clarified whether the security firm who the Gardaí were facilitating had the appropriate documentation of identification, and under what legal basis they were there. A Garda spokeswoman said in relation to Tuesday night’s operation: “An Garda Siochana’s role at such events is to facilitate peaceful protest while protecting the rights of individuals to do their lawful work safely, in this case carrying out an order of the High Court. “Our objective with any such operation is to ensure the safety of the public. In reaction to Tuesday night’s arrests, a further protest was held this evening. Hundreds of protesters met at North Frederick Street and marched into Dublin city centre, eventually stopping traffic on O’Connell Street by sitting on the road.